"To be the best of nothing is not the target, To be the best of the best is the goal "
of webdesign, webprogramming and the mot importent thing of all, well informed of StarTrek. 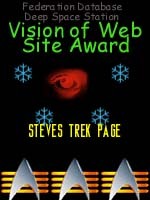 StarTrek site of 1999-2000 is Steves Trek Page. His site is always up to date, he got a easy way of navigation, simple but well done graphics in his site. future has got to offer. 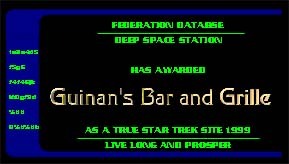 This site has been awarded by many other StarTrek sites on the Internet. I have sorted them in order newest first and oldest last. 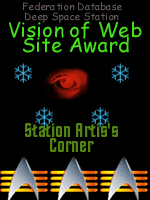 Take a look and see who they are and why I was awarded. 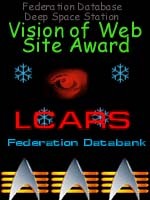 The Federation award of great webdesign is given out to sites that are made great in web design and graphics. To apply for this award you just fill out the form below and see if you are awarded. 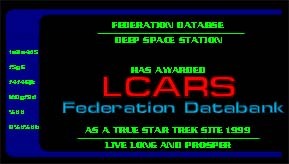 The Federation Database Award is given out to the sites that are created for StarTrek, information, webrings, fan clubs, artists and more. To be awarded the site needs to have the Disclamier of Paramount Pictures, see at my main page you can use my text, a area of StarTrek only, or hole the site, easy to navigate around the site, a fast site to use - no long time waiting for music, images and more. If you belive you deserve this award and your site has the value so it can be awarded by us then fill out the form below and we will se.